Available in 1.6Ω and 1.8Ω (+/- .2) resistance. 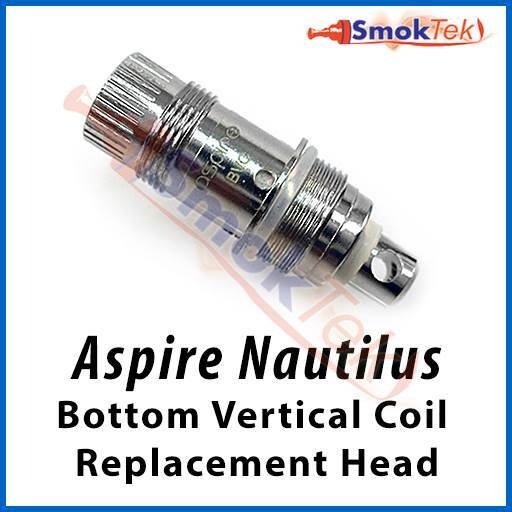 These are replacement bottom vertical coil heads for the Aspire Nautilus Mini BVC pyrex glass tank, but are also compatible with the full-sized Aspire Nautilus. The BVC coils are unique because instead of a wick, they feature a vertical coil wrapped inside ceramic cloth. BVC coils improve on the original Aspire Nautilus bottom dual coils by providing even better flavor and vapor, as well as having a longer lifecycle. It is easy to replace the coil: simply remove the bottom assembly, take out the used coil, and screw in a new one. Fill with your favorite e-liquid (avoid getting any juice down the center tube) - a needle-tip bottle makes the task effortless. Put back the bottom and you are ready to vape!